Our last week before our holiday was one of many gatherings, one happier than the other. On Monday we did two quite remarkable things. 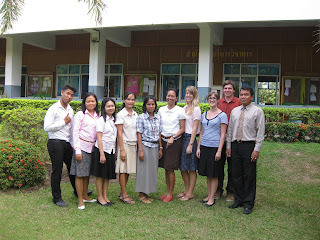 In the morning we went to the hospital to finally address the issue of our work permit. One thing that immediately caught our attention: the biggest part of the hospital was out in the open. And then: the great number of people sitting on plastic chairs like they were waiting for a bus that would never arrive here. There were some wooden benches but they were reserved for the monks. When it was our turn, they checked our weight, height, blood pressure and alcohol usage (We’re in perfect shape by the way). After that we were ushered to the X-ray room where we, obviously, had to take an X-ray. After all of this was finally over we paid and left. When we get back to school we saw the fifth year getting ready for the parade. This parade was held in honor of Buddha’s last reincarnation. Every local school made a parade float and then they all went to the local temple (the one where we were blessed by the Head Monk). We followed the procession and the funny thing was the locals were taking more pictures of us foreigners than checking out the parade itself. 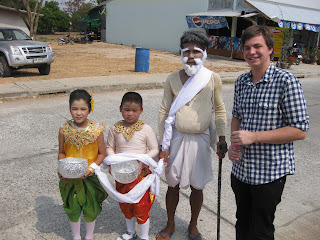 It was really hot while we were walking and we gladly accepted the cups of water the local onlookers offered us. Not to mention the ice-cream on the way there was Godlike. 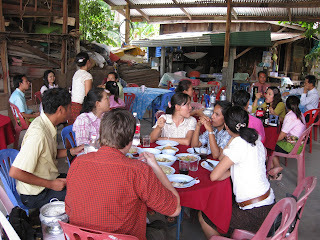 On Tuesday we were invited for lunch at a Khmer wedding. The bride is a teacher at our school and she wanted to have the foreign teachers to eat at the wedding as well. The food was very nice and the people we had lunch with as well. The strange thing: when you go to a Thai wedding you receive a gift instead of giving one. Of course we declined the bag of food and soft drinks but the other partygoers eagerly took the bag home. The rest of the week was strange enough very confusing. We were of course very excited for our holiday was creeping closer and closer but on the other hand, we had to say goodbye to so many lovely pupils. Some of them are going to a different school next year so it really a definite farewell and that made it even harder. I know it sounds ridiculous but the bond we have created with these pupils in the last three weeks is really strong. We also said goodbye to a fellow foreign teacher: Mercedes. She has lived here for over 1 year now and she will soon go to an elementary school where they have an English program. Our fellow teachers wished us the best of luck on our trip and asked us to take as many pictures as possible. Because most teachers are not very rich, pictures are there only way of seeing the beautiful coastlines we are going to witness in the South of Thailand. Bring it on!